When Nike announced a fourth silo back in 2009, most consumers said there simply wasn’t a market for one company to make that many boots. Since then, the CTR360 series has become a favourite with players and fans alike – but is the Nike CTR360 III a continuation of good form or the end of a hot-streak? We find out in our exclusive in-house review. 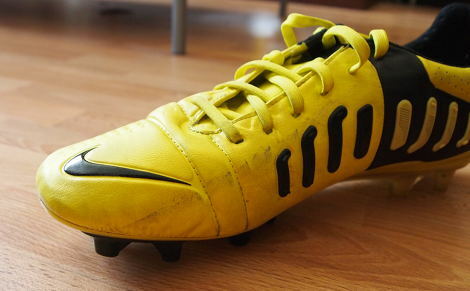 Given that this is a Nike CTR360, the top score here should provide no surprises to anyone that’s ever worn them! 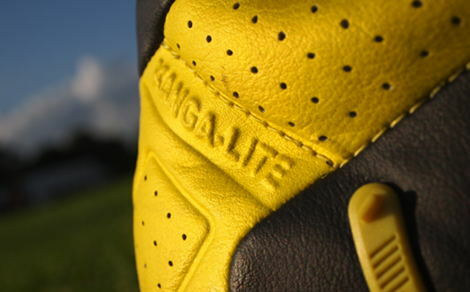 The Kangalite is as soft and supple as it has been on the past two models, so there’s no problems with ‘hot spots’ on the toes or midfoot. The heel and collar are lined in a high-friction suede-like material that also does a great job of keeping the Nike CTR360 III locked on to the foot and all-but eliminating heel slippage. Whilst many see the last CTR360 as one of the best boots on the market for touch and feel the CTR360 III actually beats it, in my opinion. The new All Conditions Coating (ACC) offers an increased level of friction that the Maestri II was lacking, giving a better feel for exactly where the ball is on your foot. Whilst the boot is perfectly designed to take the sting out of zippy passes and cushioning the ball from height, I have been spoiled by the super-thin uppers on the Mercurial Vapor VIII, Puma King SL and Tiempo Legend IV and have grown to prefer that almost-barefoot feel on the ball – so if you prefer a little more cushioning from your boots, bump this one up to a 5. The design and innovative integration of the boot’s signature control-focused technology definitely get the thumbs up from everyone we’ve shown the boot to, and the little details like the embossed ‘maestri’ on the tongue and ACC indicator on the heel are nifty little touches you’ll grow to love. The only point of contention is the colour – Nike’s new Sonic Yellow is exceptionally bright – if you were expecting something like the Tour Yellow from the CTR360 II, you’d best don some Ray-Bans for when you unbox the III’s! 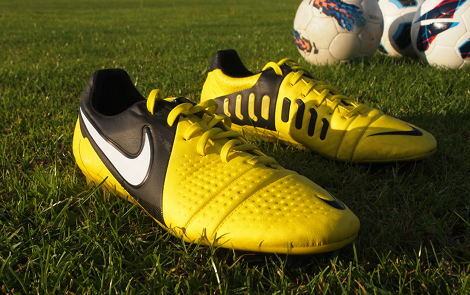 Following on nicely from the colour, looking after the Sonic Yellow Nike CTR360 III‘s is a real exercise in frustration! 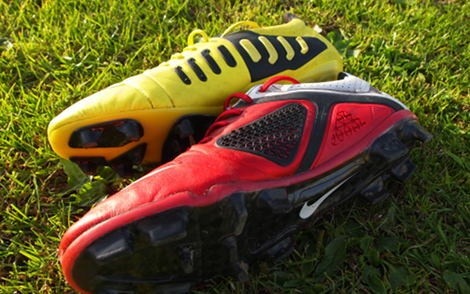 After you’ve worn these cleats on a dusty or muddy pitch, it’s almost impossible to get them back to their former lustre. Worst of all, the ACC makes the upper almost grainy to the touch – making them prone to scuffs. The one in this picture is the result of copping the business end of someone’s FG stud during a tackle, and is impossible to shift despite our best efforts. But all this is purely aesthetic; there’s no problems with soleplate separation or a recurrence of the eyelet-ripping problem that some people reported with their CTR360 II’s. 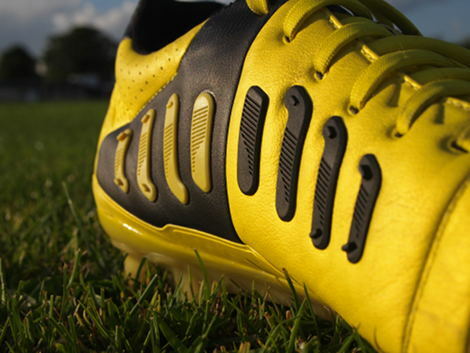 As with the Predator LZ, the CTR360 III is a great example of a boot that achieves what it sets out to do, flawlessly. The upper’s additional grip gives an excellent feel on the ball, without ever feeling clunky or obtrusive. The redesigned 3D instep passing area is another excellent improvement. 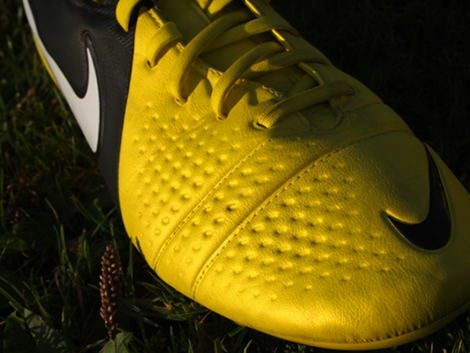 As well as looking striking and unique, it is both larger and more flexible than the CTR360 II’s pass and receive pads, making the whole instep more flush-fitting to the foot, whilst giving a greater surface area to spray passes from. An under-appreciated aspect of Nike’s design, the American brand can add another world-class soleplate to it’s collection; the CTR360 III‘s combination of longer, different-shaped studs are both comfortable under-foot, and offer excellent traction. Yet another £155 price-tag (though they have already been slashed to £131.99 on the Footy-Boots.com store) necessitates another average 3/5 score. If I can say anything in the Nike CTR360 III‘s defence in this department, it’s that – aside from the scuffing problems – they definitely feel like a solid boot that will last you a season, and the FG soleplate’s new, longer studs might give you another couple of weeks of use when winter rolls around. Another exceptional entry into the Maestri range, the CTR360 III feels like a real step-up for the series, rather than an upgrade for upgrade’s sake. 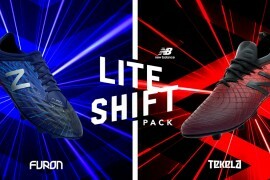 If you’re not a fan of super-thin speed boots, but still want a boot that feel light and supportive underfoot – these are a boot that will suit you down to the ground, no matter where you play on the pitch. 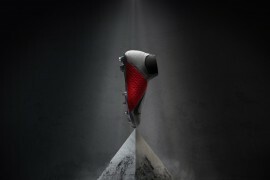 amazing boot, by far the bet i have ever played in and i dont like synthetic boots either. Glad comfort and fit and 5/5. How’s the sizing? True to size or did you play up/down a half size?